OLY ARTS is a multi-platform publication. Each issue appears in PRINT, hand-delivered by arts aficionados to local patrons, as well as ONLINE at OlyArts.com and in dedicated MOBILE editions that include regular news and calendar updates between print editions. OLY ARTS’ new iOS App delivers arts and culture news in a new app that works on any iPhone or iPad. Download the app (for free) directly from the Apple iTunes Store. 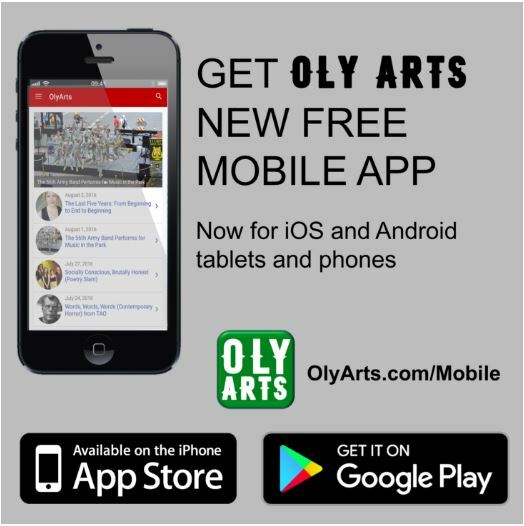 OLY ARTS’ Android Mobile App further demonstrates our multi-platform approach to providing the best in arts and culture news. Download the app (for free) directly from the Google Play store.